Two friends prove pre-owned rides are also worthy of showrooms. 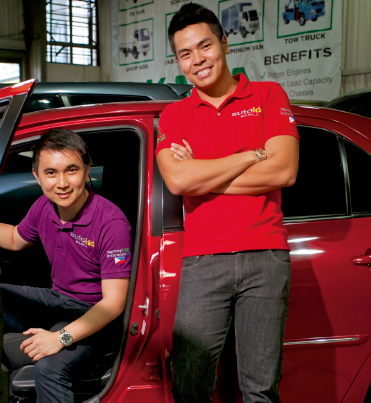 In the car dealership industry dominated by seasoned businessmen, friends Marvin Tiu Lim, now 27, and Kevin Yao, now 28, are the new kids on the block. But do not undermine their business acumen and imagination. Starting from what Lim describes as “buying and selling secondhand cars online” and using the family garage to showcase the cars to potential customers, Autokid now boasts a 1,200 sq m showroom in Quezon City. The clean and spacious display area, office and one-stop shop, which opened in October 2011, is now home to around 80 cars, mostly models from the year 2005 and up. What makes Autokid unique from other players in the industry, Lim and Yao emphasize, lies in several factors. Autokid has its own car bay where well-trained technicians—and sometimes Yao himself, despite being a nurse by profession—regularly check the quality of the vehicles to be sold. For his part, Lim, who handles marketing, addresses the customers’ needs both before and after a sale. Autokid has a luxurious customer lounge, where clients can read, drink, watch DVDs, listen to music, or simply hang out while their documents are being processed and the car is released. Autokid also recently introduced Insurancekid, giving customers the option to cover their motor insurance needs with the help of leading non-life insurance providers. Already selling 25 to 30 cars a month on average, Lim and Yao are looking to expand their business. They have branched out and introduced Taxikid with a starting fleet of 25 taxis now operating around Metro Manila. Lim attributes Autokid’s early success not only to the pair’s creativity and daring attitude but also to finding good people to work with. From just a team of three last year, the business now has 13 full-time employees—drivers, technicians and marketing staff. This article was originally published in the November 2012 issue of Entrepreneur magazine. Subscribe to the print or digital version here.